After an intern offsite on Friday I dropped by Silicon Valley Auto Group to see what they had. Boy was I pleased when I saw this. 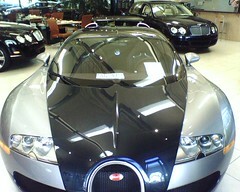 The Buggati Veyron. This car is huge! Boatlike even. But it is faster than every other car on the planet. Someone buy me one please? I’ll give you my Elise and Jeep. This entry was posted in Cars on August 12, 2006 by stuart.